Tasmania achieved the silver award nationally for highest median weekly family income growth in the PRDnationwide Q2 2018 Key Market Data Indicator Awards. It is increasingly evident that 2018 marks a new era for TAS, from both a property and economic perspective. In the PRDnationwide Q2 2018 Key Market Indicator Awards TAS won the silver award nationally for highest median weekly family income growth, at 2.6% over the past 12 months (to $1,417 in the December quarter of 2017). This is an improvement from last quarter, where TAS earned the bronze award nationally for the same category, with a 2.5% growth over 12 months to the September quarter of 2017. The increase in median weekly family income has come at a perfect time, as TAS’s home loan affordability growth recorded the highest decline amongst other states. Over the past 12 months to the December quarter of 2017 the home loan affordability index declined by -5.4%, which was even more than VIC which only declined by -0.7% and is historically known as the more unaffordable state between the two. 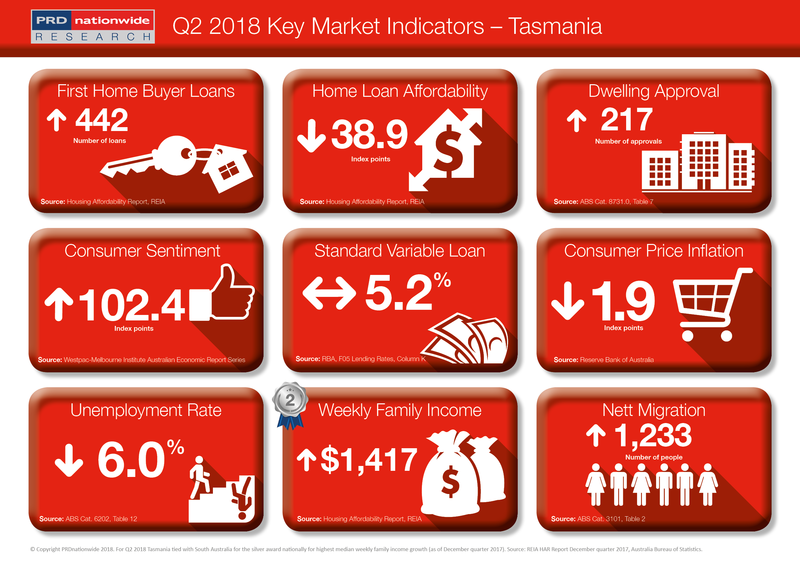 Affordability issues are further confirmed when looking at the number of first home buyer loan growth, as TAS recorded the lowest growth of 4.0% over the past 12 months to the December quarter of 2017. In a shocking contrast, the number of first home buyer loans increased by 74.9% in NSW over the same period of time. Furthermore, Hobart recorded a 153.2% increase in nett migration over the past 12 months to September 2017, yet its dwelling approvals only increased by 7.4% over the past 12 months to March 2018 which is nowhere near the supply needed.